Dear weirdo, the vest looks cute. When are you going to post about your trip to Japan? I miss you!!! 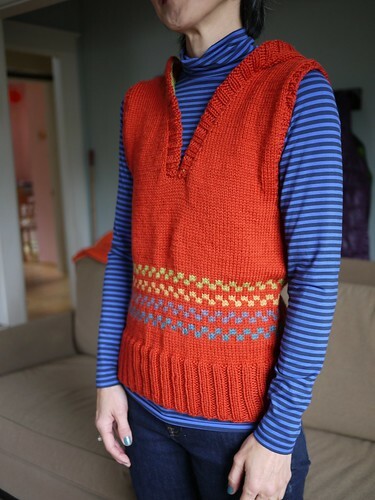 Also why isn’t this in ravelry so I can fave it? I think it is super cute, and great colors! Just what you need in the winter. A wash will make everything settle nicely, I think. It looks great as it is, but I know the feeling of wanting it to look just right. And really nice to see you knitting again. More on rav, please!! It looks like your gauge changed a bit when you were doing the color work, but that is conveniently where the waist shaping would be. It will most likely look better after washing, but it does look perfectly lovely in the picture. That is a great looking vest! Super Eggplant was my first blog and still a favorite…miss you!